FIRST WEEKEND OF EVERY MONTH AT THE SAME TIME AS ARTS IN THE PARK. For more information ring Maria 082 852 3850 or the above. This was started in 2009 in memory of John Rowlands who died after a long illness. He joined the Club in 2002 soon after it started at the Zoo Lake, having played the game as a student in Oxford University, in England. John became very involved in the running of Zoo Lake Club and his memory lingers on. In 2009 Christine Wakeham was first the winner of the impressive trophy donated by his widow Una and daughter Sarah. In 2010 Anne Weiss was the winner. The tournament is played using the Zoo Lake Irish rules which provide a different challenge to the normal Golf or Association played in Gauteng. We all wore green and were entertained with limericks. Mark Corcoran took the honours, it was a pleasure having someone from Zoo Lake win it. The food was marvellous and the company outstanding. It was won by Jessie from Golden Mallets. This year the Limerricks were very special and we thought they should be shared. Here they are with thanks to Mike Corcoran and Marilyn Grootes. 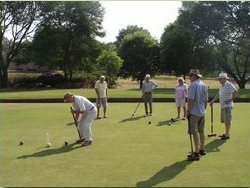 As Zoo Lake was temporary closed The Golden Mallets invited us to hold our competition at the Club in Hilson Park. With the African sun that never lets us down. The braai of hamburger and borewors rolls. Chocolate cake and teas available all day.